And hopefully you'll come to the realisation that leather care and maintenance really is quite simple and not a mysterious as it's made out to be. 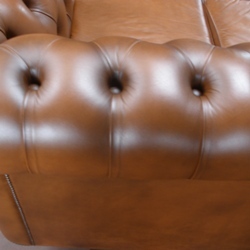 First, let's take a closer look at leather when it is brand spanking new! Here's a photo of a brand new leather couch. Never been sat in or exposed to the environment ... just sitting there on the showroom floor. It feels soft, warm, waxy and people can't help rubbing their hands over it! In the tanning process, natural oils are added to help reduce friction in the leather fibres and keep it soft and pliable. Yes, it's true, the leather is dyed right through in the tanning, but that doesn't give you a solid colour . . . it's only a stain. Now the finished colour is a flexible, polyurethane-like film which is sprayed over the leather surface to achieve the desired affect. A clear sealer is then applied to improve performance and alter the way the leather feels i.e. : waxy, slippery, silky etc. The take-away here is ... the finish is very thin film which makes it susceptible to damage if not treated with respect. This means, the finish does NOT completely seal the leather like vinyl or other household surfaces. It is micro-porous and allows it to breathe. That's why in summer it feels cool and in winter, warm. You need to be aware that its tiny pores will slowly lap up any chemicals or contamination which happen to sit on the surface. Your leather upholstery is made from cow hide ... or ... cow skin. Now, cow hide has very similar qualities to human skin: it's flexible, it's micro-porous and it needs a moisture content to keep it supple and in good condition. Can you imagine what would happen if one day we decided to stop cleaning and conditioning our skin? Well, it wouldn't take long before it would dry out, the pores would clog and premature aging would set in ... this is exactly the same with leather. After a few years of wear-and-tear and neglect ... a completely different story. That beautiful leather you were once so proud of, has become more of an embarrassment! 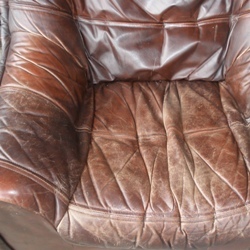 The natural oil content will evaporate causing your leather to 'dry out' and lose its softness and flexibility. Direct heat and sunlight will speed up this process. A perfect example of this is car leather ... at the top of the rear seat. Car interiors are subject to such dramatic temperature changes, the leather can very quickly go hard and boardy. Another good example ... outside backs and tops of lounge suites left in direct sunlight. 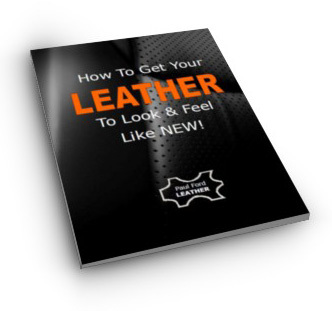 Perspiration, body oils, and other contamination, will quickly build up on the surface of leather and penetrate into the pores of the micro-porous finish. Often, nothing is done to clean these away, resulting in a built-up residue of acidic grime which will slowly ETCH into the finish, undo the binders and pigments holding the finish together ... thus shortening the life of leather. This is particularly noticeable in areas where heads, hands and bare skin have been in constant contact. In fact many 'off the shelf' leather care products sold to consumers were found to cause more harm than good because they contain known destroyers of leather finish such as bees wax and silicones. With constant abrasion and sliding back and forth over the surface, the finish will often stain, discolour and eventually wear through exposing the raw leather. A good example of this is the leading edge of the drivers seat in car leather. Without proper care and maintenance, the finish can wear out prematurely. And let's not forget to mention the scuffs, scratches and claw marks which leave permanent scarring in the finish. And To Top It Off ... Most People Have No Idea What To Do About It! 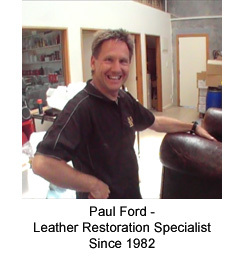 Now, you can understand why many folks are left scratching their heads as to what to do about leather care. And I don't blame them because I too was looking for a simple solution I could use in my professional work and also recommend to my clients. Over the years, I've tried and tested many different leather cleaners, conditioners and protectors but unfortunately, I found the results of these to be disappointing. Many of these were combination products such as cleaner/conditioner, conditioner/protector etc which believed diluted their effectiveness anyway. So I decided to commit some serious effort into solving this problem and find the best and most effective way to keep leather in top condition.